Go to the first tab on the ribbon (its name corresponds to the type of interaction you're building), and click Interaction Properties. Select the Quality tab on the left edge of the window. Standard: This is the default setting. 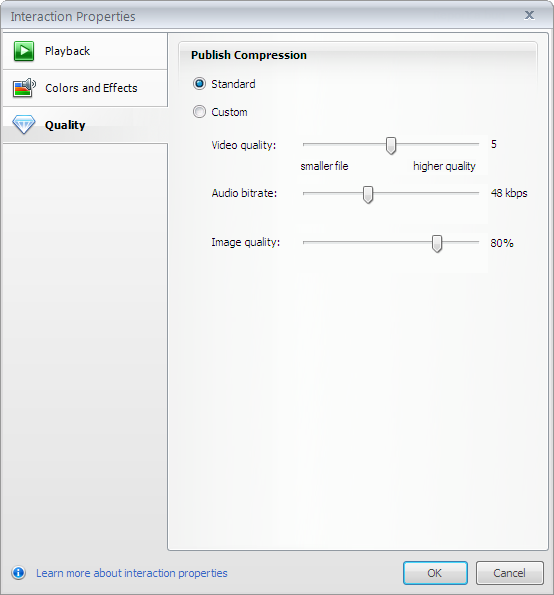 It uses a video quality of 5, audio bitrate of 48 kbps, and image quality of 80%. Custom: This option lets you define your own quality settings. Click and drag the slider on any of the three values to change the compression. Using higher values gives you higher-quality output but also larger file sizes (which means longer download times). Lower values give you smaller file sizes and faster download times, but the visual and audio quality will be lower as well. The quality settings you choose get applied when you publish your interaction.